A great philanthropist’s lifelong passion for Islamic art and culture lives on in this exotic Hawaiian estate, writes Jason Mowen. THROUGH LARGE but nondescript iron gates at the end of a mildly affluent, suburban cul-desac near the foot of Diamond Head in Honolulu, a long driveway leads to an entry court. A pair of carved stone camels flanks a large timber door, seemingly the only access point to a structure that if not for the surrounding tropical flora feels more North Africa than Hawaii. 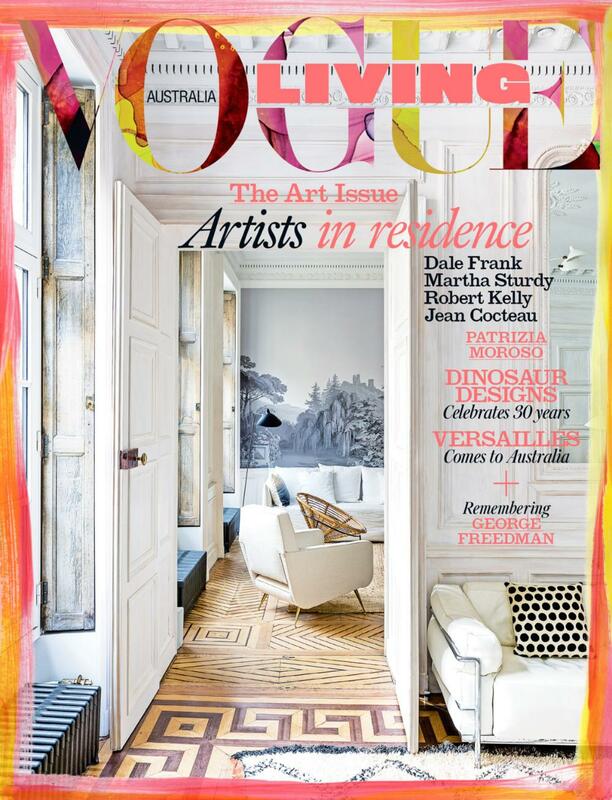 There’s a sobriety, albeit slightly exotic, to the entry court; beyond, however, lies what can only be described as an orientalist fantasy of architecture, garden and interior design, replete, most significantly, with an exceptional collection of Islamic art. 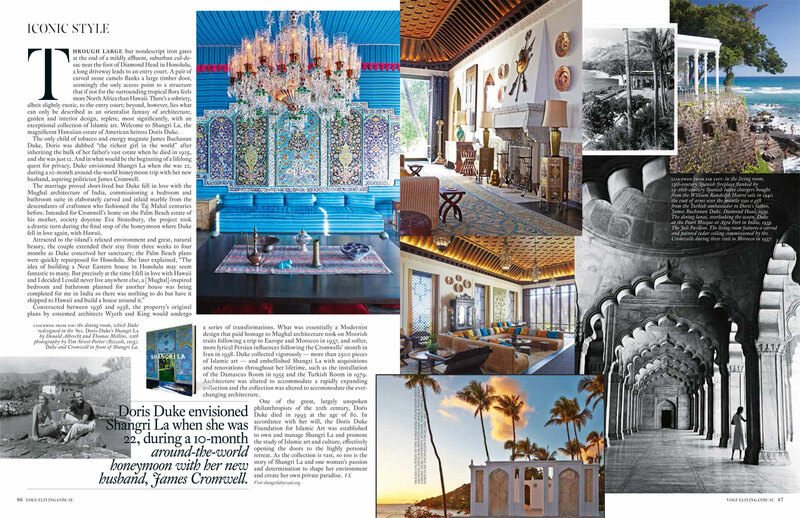 Welcome to Shangri La, the magnificent Hawaiian estate of American heiress Doris Duke. The only child of tobacco and energy magnate James Buchanan Duke, Doris was dubbed “the richest girl in the world” after inheriting the bulk of her father’s vast estate when he died in 1925, and she was just 12. And in what would be the beginning of a lifelong quest for privacy, Duke envisioned Shangri La when she was 22, during a 10-month around-the-world honeymoon trip with her new husband, aspiring politician James Cromwell. The marriage proved short-lived but Duke fell in love with the Mughal architecture of India, commissioning a bedroom and bathroom suite in elaborately carved and inlaid marble from the descendants of craftsmen who fashioned the Taj Mahal centuries before. Intended for Cromwell’s home on the Palm Beach estate of his mother, society doyenne Eva Stotesbury, the project took a drastic turn during the final stop of the honeymoon where Duke fell in love again, with Hawaii. Constructed between 1936 and 1938, the property’s original plans by esteemed architects Wyeth and King would undergo a series of transformations. What was essentially a Modernist design that paid homage to Mughal architecture took on Moorish traits following a trip to Europe and Morocco in 1937, and softer, more lyrical Persian influences following the Cromwells’ month in Iran in 1938. Duke collected vigorously — more than 2500 pieces of Islamic art — and embellished Shangri La with acquisitions and renovations throughout her lifetime, such as the installation of the Damascus Room in 1955 and the Turkish Room in 1979. Architecture was altered to accommodate a rapidly expanding collection and the collection was altered to accommodate the everchanging architecture. One of the great, largely unspoken philanthropists of the 20th century, Doris Duke died in 1993 at the age of 80. 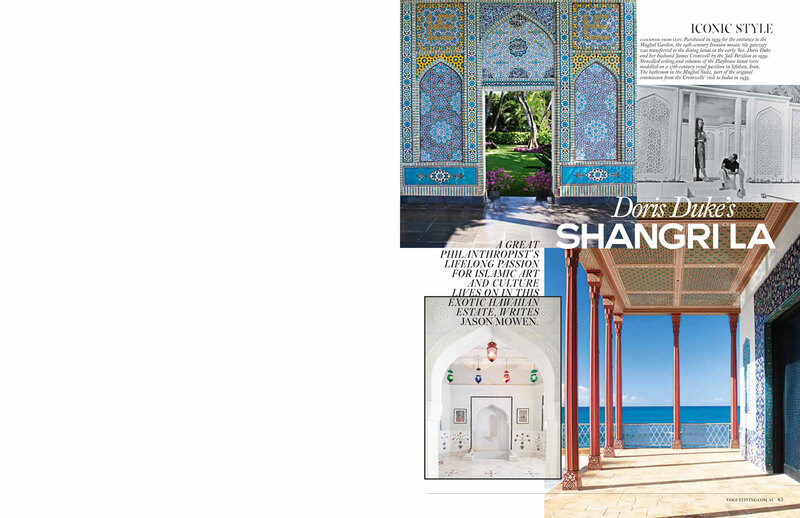 In accordance with her will, the Doris Duke Foundation for Islamic Art was established to own and manage Shangri La and promote the study of Islamic art and culture, effectively opening the doors to the highly personal retreat. As the collection is vast, so too is the story of Shangri La and one woman’s passion and determination to shape her environment and create her own private paradise.